This summer, we’d like to return and talk about some of our most useful, engaging, or popular posts. Today’s post, written by Shana in 2015, reminds us that formative assessment doesn’t have to be intimidating. Please return to this topic and talk with us in the comments–how do you build routines for formative assessment into your classroom? Sometimes I wake up in the morning, thinking about what I’ll be teaching and learning that day, and feel like a rebel. 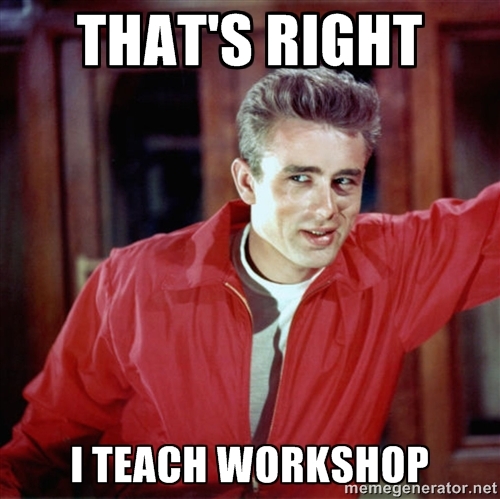 That’s right–I think to myself, feeling inexplicably cool–I teach workshop. Yeahhhhh. Even though this is the most research-based, data-driven form of instruction I’ve encountered in my teaching career, a successful workshop is still such a rarity that I feel like I’m breaking all the rules by employing it every day. I’m a rebel with a cause. I know when I am learning a new skill, I want to be able to practice–free from judgment–so that I might build some confidence before I am formally evaluated. The same is true for kids. We should give them opportunities to practice and build confidence. One grade per week, when I’m grading to evaluate, is impossible. We don’t master a different skill every single week. Mastery requires practice. So, I’ve focused lately on formative assessment for eight out of the nine-week grading periods, and summative for just one. Here are the four categories I see formative assessment broken down into, and how I put them in the gradebook. 1. Writer’s notebooks – I collect writer’s notebooks every two weeks, and students can receive up to 20 points per collection. If all of our prompts and exercises are present, and I can see the student’s effort, he or she gets the full 20/20. I also ask students to mark for me anything they’d like feedback on. I check to see the status of their to-read, wondrous words (vocab), and cool craft (quotes) sections, but I also look for a telltale pink sticky note. If I see one, I read the marked piece and write back–just feedback. 2. 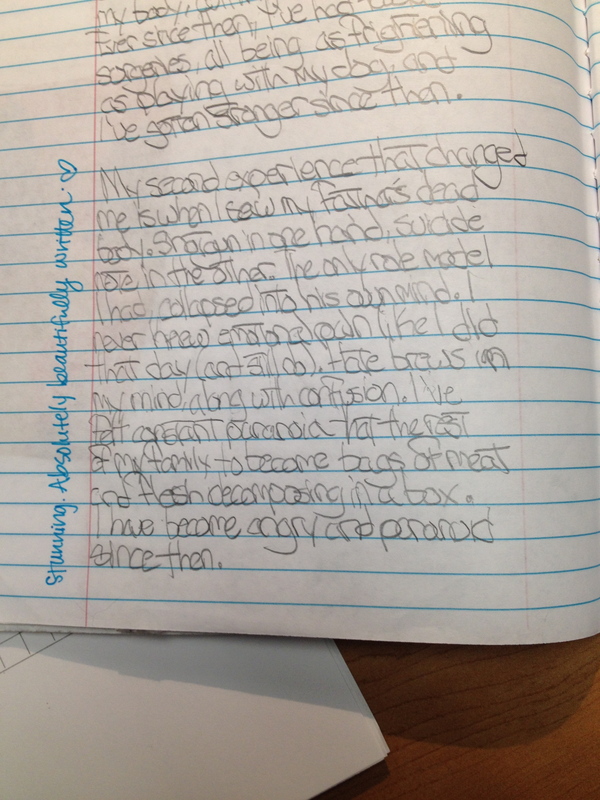 Reading logs – Our reading logs are quite messy; you can see one example here. There are arrows everywhere, new reading rates scribbled in, and tons of titles being read every week. When students complete their reading goal of two hours per week–determined by individual reading rates–they get 10 points, every week. 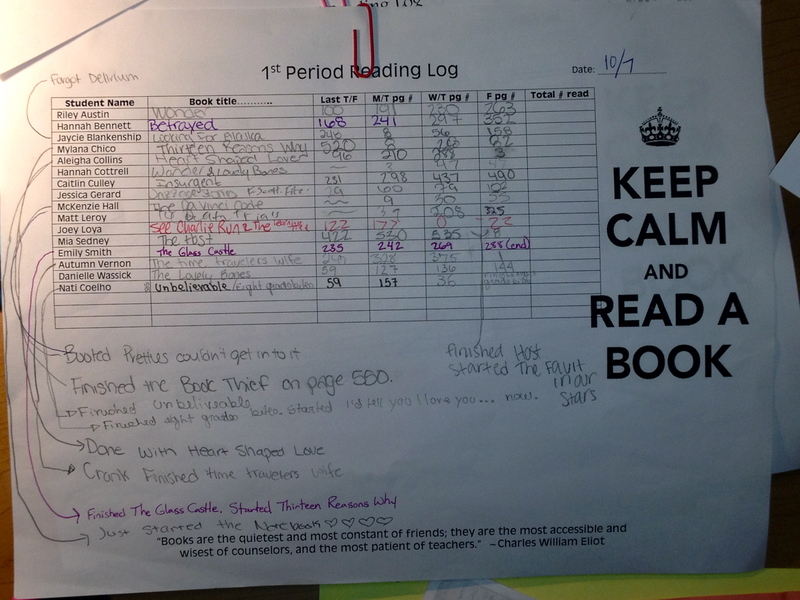 Reading logs show me the big picture of a class’s progress, while conferences help me go deeper. The reading log lets me know, at a glance, who’s soaring and who’s not–helping to give my conferences direction. 3. Vocabulary – I still remember my orange Sadlier-Oxford vocab books from high school. Those well-worn paperbacks were the source of many a cramped hand and a frantic fifteen minutes of homeroom before English class. I know from personal experience that I don’t retain new words by completing fill-in-the-blank exercises–I learn by reading widely. So, I ask my students to maintain a “wondrous words” section in their notebooks, writing down unfamiliar or unknown words as they read. Then, I give them a different activity to complete with those words every two weeks. The activities are worth 10 points each, and run the gamut from writing stories using the words to drawing pictures illustrating their meanings. 4. Honest self-assessments – When we finish a unit of any kind, usually about once a month–a writing unit, a reading unit, a book club, a challenge–I pass out a half-sheet with self-assessment questions on it. I begin each half-sheet with a disclaimer: “Be honest. There’s no judgment here. I just want to know why you were as successful as you were with this unit, and to know how I can help others be successful in the future.” Students answer very truthfully, sometimes humorously so. If their answers are thorough, they receive 15 points. These four formative assessments total about 115 points per month. With 9-week grading periods, students’ grades therefore are made up of about 2/3 formative assessments (230 points or so) and 1/3 summative assessments (100 points or so). Well over half of the formative assessments are credit for the simple acts of doing the assigned reading and writing–no evaluation of those acts, just credit for the effort. I value practice and process over product–and this grading system reflects that. How do you handle grading, formative assessment, evaluation, etc.? Please share in the comments! I just finished Katherine Bomer’s They Journey is Everything and she talks…I think…all my reading is a jumble in my head about students, assessment, reading and writing… about two groups of students in a pottery class. One group is told to make one perfect bowl (formative) and another to produce 50 pounds of pottery (process) in the same time frame. The group that produced 50 pounds had a better outcome because they tried, learned, tried again and ultimately had more practice with less pressure. That’s exactly what I see you doing. You are inspiring students to create, reflect and create more. Then they get to build and reflect on their skills. Do you have students set their own goals to work towards, as well? I try & I’m going to embed more of that in my program this year, especially around grammar. 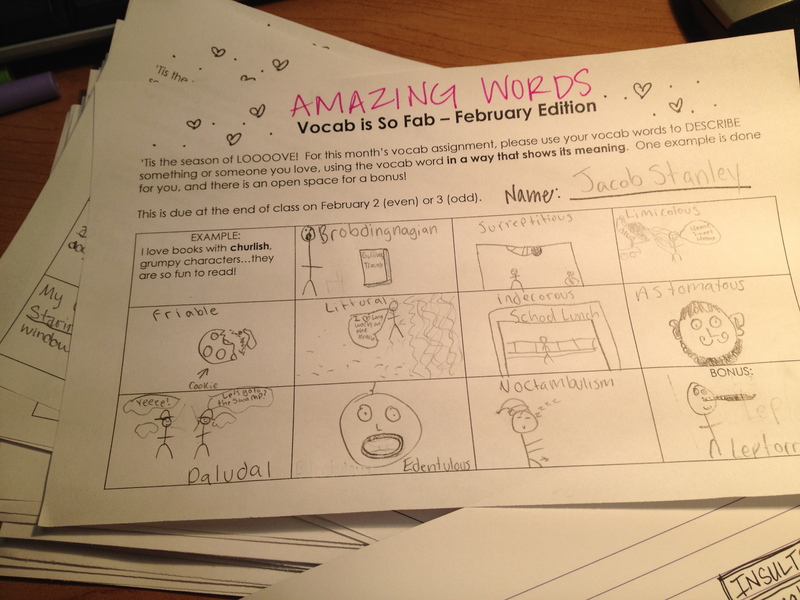 I’d love to see more examples of your vocabulary activities too. I’m saving this post to help me adjust and adapt my workshop program for next year. I’ve got to get my students to write and use their WRNs more than they have over the last two years! Thank you for this post! I’m feeling a little more James Dean like, just because of you! Stefanie, I totally know what you mean about all of your reading becoming a jumble in your head! Story of my life. I always have students set their own goals. That’s where the self-assessments and self-reflections come in…quarterly reading ladders, notebook harvests, and state-of-self conferences with me are places where they can create goals and then assess their progress toward them. I use a variety of vocabulary activities…just whatever pops into my head that will get kids playing with language. Sometimes we tell stories with our words…write practice dialogue back and forth with our words…illustrate them, create synonyms, do booktalks with them, whatever. Anything that encourages practice is perfect!